Our range of products include air tight stainless steel containers, magnus airtight containers set, magnus chocolate box, klip lock deep container, lock seal containers and airtight khakra box. 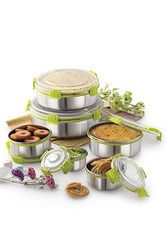 Magnus Stainless Steel airtight Containers are a first time in India concept. 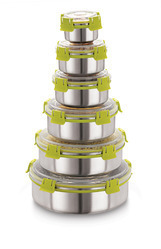 Magnus Container set is an airtight, leakproof, spill proof container set. Made from FDA approved raw materials, we take care of the smallest detail from the point of view of the end consumer. Also used for gifting purpose this set of 3 pcs. will make a long lasting impression. Magnus Chocolate box is the perfect return gift for every occassion, from chocolates to dry fruits to sweets and mithai. Birthday gift, Anniversary gift, Engagement Gift, Marriage invitation card gift, Festive gift etc. For all occassions, magnus chocolate box is ideal for keeping contents fresh for longer hours. We supply 100% airtight, liquid-tight, stackable deep container. 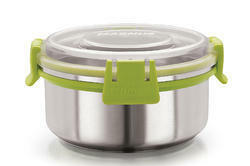 Magnus airtight container series have a unique feature of detachable clip which solves the clip breaking issue in normal airtight containers. Products are made of 100% food grade raw materials. These containers are available in 6 sizes. lock and lock stainless steel containers have huge demand because of their property to keep food fresh for many days at a strech. 100% recyclable these containers are a superhit product. These containers are the best available that money can buy for best food storage. Aitight khakra box is best used for keeping khakra box crisp for a long time. Lock all the five klips properly to make the best use of the kharkhra box. Can also be used as a papad box. Clear plastic airtight container with detachable clips so that they don't break, 300 ml in capacity. We have different capacity containers. Keep food fresh for a long time. See through container so that what is kept inside can be seen.